Having thoroughly enjoyed the unseasonably warm weather we've been experiencing here in SF, I knew I wanted to spend a majority of this past weekend over in the man friend's neighborhood (to take full advantage of the 5 minute walk to the beach). That said, weekend packing isn't exactly my forte (let's just say I almost always bring too much with me) so I wanted to make sure to pare down to just a few basics -- hence a lot of T Shirts. Of course, it's easy to underestimate a good T, which is why I'm so excited to be sharing some of my favorite StyleMint pieces over the next few days to help dispel that notion. The fit and the fabric quality of these Ts never disappoint and the fact every piece is designed by Mary-Kate Olsen and Ashley Olsen certainly doesn't hurt either. But I digress. The first look in our beach-bound lineup? A breezy little T Shirt dress, perfect as my bathing suit coverup for the afternoon! 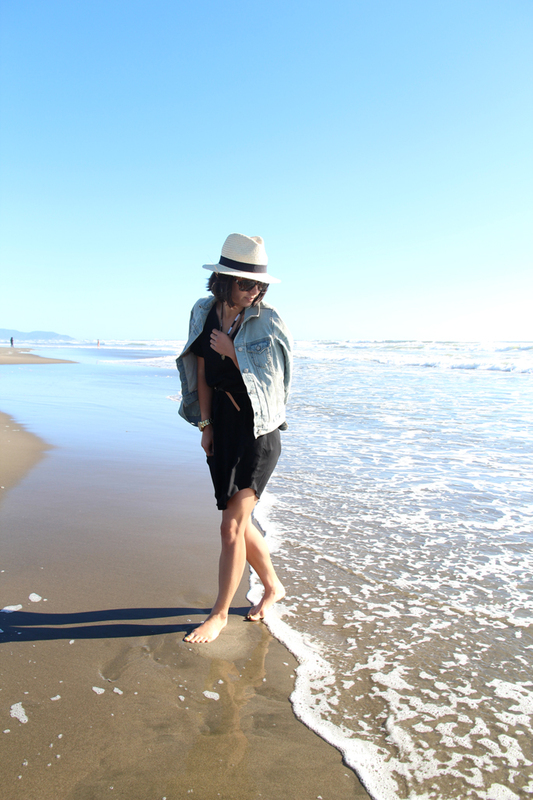 I went with some of my summer go-tos to accessorize this look (hello denim jacket and straw panama hat!) but I'd love to know how you would style this number! Let me know in the comments below. Disclaimer: While this is a sponsored post, I just wanted to reiterate that I would never partner with a company that I didn't completely believe in myself. Can't wait to see your picks! I love StyleMint pieces! Lovely casual look, perfect for the beach! Beautiful! Now you have me dreaming of Summer- so cold here in Melbourne. Great look for the beach, you look lovely! You look so beachy chic! Love that hat on you! Can't wait to see the rest of the pics. Love the dress, perfect for the beach! That dress makes such a fantastic summer staple! Very beautiful, summery photos :) You look great! I love the use of the word man friend. Lovely outfit. Perfect beach. I just bought 2 tops from them yesterday after getting a buy one get one free email! haha I only have one sleeveless top so far and was surprised by how amazingly soft it was. Can't wait to receive my next 2 pieces! Great post - I love seeing you in casual outfits! Love this one! Love the fedora! And I'll trade places with you...I'd love to be at the beach! lol. That dress is very cute! Perfect for the beach. Perfect outfit, perfect location! Love everything about this post! you look so cute! i haven't tried stylemint yet...but this is tempting me! you styled it perfectly - I can't imagine it looking any better! That is such a perfect casual look! And yes I agree, I LOVE Stylemint. They make simple things so chic and versatile. Great Pics! Cool casual look! Great dress and I love your necklace. Looks like you're having fun! Great outfit! I need a jean jacket ASAP. I wish I was in that beautiful beach. A little jealous. of your look, and the scenery. gorgeous! Have you entered my giveaway yet?! Twin gold cuffs you won't want to miss out on! You look fabulous, I need to get myself on over to style mint! Also a 5 minute walk to the beach? So Jealous! I ordered this dress and am on the fence, only because it is so thin (you can see the outline of your legs in the light). I love the style though. Are you wearing a slip with it or something? Heart your denim Jacket! beautiful place to shoot! so easy, breezy and lovely. Cute beach outfit! Casual and comfy!! Great pictures! I love the necklace! aw, you look so pretty! this outfit is adorable! The jacket + hat are so dead on! Love that panama hats are so on trend now, I finally get to wear mine from South America without people asking me oh hey your fedora looks a little funny! I absolutely love how you styled that dress! such a cute outfit. & love the fedora. you look so adorable in that hat! I wish I could pull that off!! !